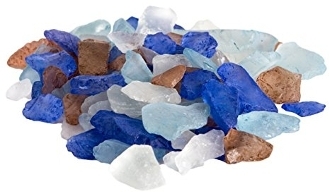 10Oz Jar of PACIFIC MIXED Sea Glass For Fairy Gardening. Sea Glass come in a reusable jar for quick floral and miniature fairy garden arrangements. Makes a great feature for water too! Our newest Top Dressings are quickly becoming a top-seller for interior decoration and modern outdoor gardening. Perfectly sized for Fairy Gardens!